Regular pool maintenance can be a job itself. Skimming, vacuuming, checking the ph balance in the water and making sure all of the equipment is working properly can be a hassle. This is an amenity meant to be enjoyed to induce relaxation, not anxiety! The only thing that can kill the gleeful thought of jumping into refreshing water on a hot day is worrying if the pool is filthy or not. The experts at Triangle Pool can help keep your St. Petersburg, Largo, Seminole, or Clearwater oasis up and running throughout your busy year so that you can enjoy when the water when you want to! During the hot summer months the only thing more refreshing that a cold drink is a dip in the pool. The only thing more irritating than the humidity is discovering that your cement pond has been coated in a layer of green slime. The longer you neglect the water and lining, the longer it will take to clean when you finally decide to it. Neglecting the water can cause unsanitary conditions and safety hazards for you and your swimmers. Stagnate water carries bacteria and germs that can cause serious illness and infections to anyone who ingests it. The only way to prevent your oasis from turning into a bacteria laden pond is to clean it regularly, or hire a pool maintenance company in St. Petersburg, Largo, Seminole, and Clearwater! With our regular pool maintenance package, you’ll never have to worry about the pump breaking or needing a repair. Along with weekly cleanings, our technicians will check up on the pool’s machinery to make sure that everything is working properly. Broken parts that go unnoticed can cause irreparable damage to the pump. If the machinery stops working, then the water becomes stagnant. A working pump keeps your water circulating and also helps prevent against bacteria growth and unwanted algae buildup. 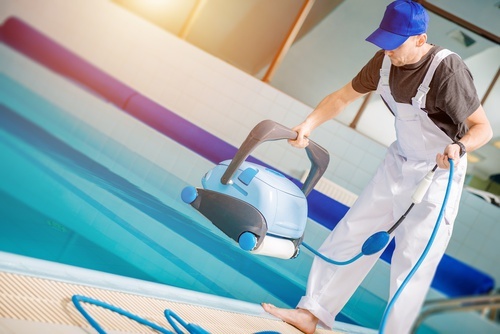 Only a professional can truly keep your water at the ideal chemical level, that’s why you should leave pool maintenance to the trained technicians at Triangle. Many people believe that using chlorine is enough to kill illness-causing bacteria. Unfortunately, UV light and heat breaks down the chlorine quickly leaving you exposed to microorganisms. Another problem with chlorine is that many bacteria and viruses have become resistant to this chemical. Our technicians will test the levels in your water to determine the best sanitizers to use for your water. Living on the Gulf Coast means that we are hit with regular storms. Downed palm tree branches floating in the water is a common sight for Pinellas County residents. At Triangle, our trained technicians will help keep your water pristine and crystal clear! Just imagine being able to jump in whenever you want. Inviting guests over to swim or throwing a party will be less stressful without having to worry about getting your oasis cleaned in time. With weekly cleaning and pool maintenance Triangle can provide a clean amenity for you at all times. Whether you use it for swimming, floating, diving, or exercise, a clean pool is essential! It’s our goal to provide you with exceptional customer service and sparkling clean water for your cement pond or spa. As the best pool maintenance company in St. Petersburg, Largo, Seminole, and Clearwater, we are dedicated to keeping our customers happy. If you’re sick of spending all of your free time skimming instead of swimming, give us a call today at (727) 531-0473 or contact us online to schedule your free estimate!